Simply beautiful all white textured design, Julia. I LOVE your die cut layered tree and framing. TFS Hugs.. I love how you created several layers to showcase this lovely tree, Julia! Great idea to use watercolor cardstock to add texture to your design...Beautiful Christmas card! 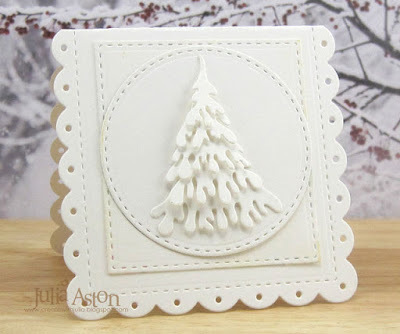 Super gorgeous monochrome white snowy tree card, Juila! Love that tree die! Glad you shared it with us at CAS Christmas! What a beautiful white on white card! Love all the stitched layers. And the layered tree is perfect with the scalloped edges of the card. Thanks so much for joining us at CAS Christmas! Love, love, love this white on white card, Julia! You know that I love this tree! I'll have to try cutting it from watercolor paper. The texture is fantastic! 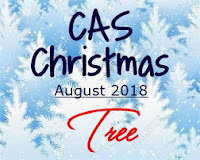 Thanks so much for sharing this with us at CAS Christmas! Classically beautiful white on white card Julia, I love all the layers which still create a CAS image :). 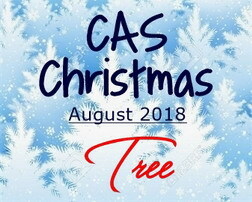 thanks for joining us at CAS Christmas.